Join the discussion on our forums! 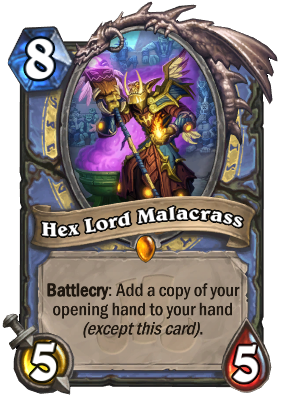 Come discuss Hex Lord Malacrass over in our dedicated Hex Lord Malacrass discussion topic. Battlecry: Add a copy of your opening hand to your hand (except this card). Extremely awkward cousin of Hex Lord Malaclass. I've been running this in Big Spell Mage and it's been sick. You get so many extra survival tools - Taunts, board clears, polymorphs. Currently running both him and Elise for ridiculous amounts of value. I just realized, this card makes it so you can play 2 copies of the quest!! True, but chances are you already won after playing the first Time Warp. Nice value generator. Probably still outclassed by Elise the Trailblazer and The Lich King though and won't find a slot yet. Will see what happens after rotation next year I guess. I still maintain that this is way too slow to see any kind of play, at least in Standard. Reno Mage is a different story. Seems like a fun card to play. I cant really imagine a really consistent enough deck with it though. Feels like a Dungeon Run card (Which I would definitely pick). Will experiment with it, given it comes in my packs. This is going to be really painful when you mulligan into it. 8 mana card in your hand and it'll give you one card fewer when you do play it? Yuck. This is no Ultimate Infestation. This looks more like a balanced version of that card. Lol, if you keep this in your opening hand, infinite value. Only good at control matchups. This card is dead when you're playing against aggro, midrange or tempo decks. Ah, but you don't see the true potential of this card. What if there was a late game threat you wanted to repeatedly bring back? Something, like, I dunno, Zola the Gorgon, Reno Jackson, Brann, Mage Death Knight or Kazakus? Reno Mage will exploit the hell out of this card, due to the fact that Malacrass doesn't even have to BE in your opening hand for his Battlecry to work. There is nothing more dangerous in a Reno deck than the ability to play Reno cards more than once in a game, and the possibility of summoning Reno an additional 1-2 times based one what else is in your opening hand is BRUTAL. Honestly though, it's a great card. Nothing like getting that hand of expensive 7 drops you desperately tried to mulligan away! Except this time you can play them! Not a Legendary I am hoping for, but not necessarily a placeholder either. - Mages were great class for almost entire history of HS. Let's nerf their early game and give them some weird legendaries. - That's a great idea!